The Legendary Writers of the "Vicious Circle"
"The Algonquin was a refuge for the brightest authors, editors, critics, columnists, artists, financiers, composers, directors, producers and actors of the times. The dining-room corner was a hot bed of raconteurs and conversationalists." 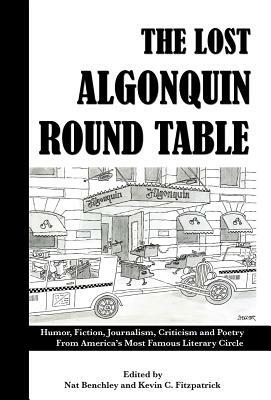 In Jazz Age New York City, no literary lights burned more brightly than those of the legendary Algonquin Round Table. Now between covers for the first time is a collection of writing by 16 members of the group, an all-star gathering that took 90 years to come together. Many of these pieces have never been published before; plucked from private family collections and "lost" pieces from obscure periodicals. ● Humor pieces by Robert Benchley, Franklin P. Adams, Heywood Broun, Frank Sullivan and Donald Ogden Stewart. ● Criticism from Dorothy Parker, George S. Kaufman and Robert E. Sherwood. ● Short fiction by Laurence Stallings and Pulitzer Prize-winners Edna Ferber and Margaret Leech. ● Journalism from Alexander Woollcott, Ruth Hale and Deems Taylor. ● Poetry by Adams, Marc Connelly, Dorothy Parker and John V. A. Weaver. With a foreword by Nat Benchley.